Many years ago - my Uncle said to me, "You must watch The West Wing," and I thought yeah right, whatever. No-one tells me what to watch. But he was persistent and he lent me the first season. And I began watching it. My life changed. My brother started watching it. His life changed. One by one, we'd pass on this wisdom to people we knew, sometimes even strangers. You must watch The West Wing. But I'm just trying to buy some groceries? Go home. Watch The West Wing. The West Wing became everything. These days; I care about the world, I have an interest in American politics, I have some knowledge on important issues, I know how to write good dialogue. This all came exclusively from The West Wing. This show is, without doubt - the most perfect thing in the history of television. The dialogue and humor are beyond anything I've ever known. It fills all these gaps that even Chaplin, Woody Allen and episodes of Frasier can't do. What's amazing is how it was done within the confines of quite serious drama. When Arrested Development was hilarious, it was to be expected - after all-- it was a wacky comedy. But this show was about POTUS (President Of The United States) and his staff. We can imagine that being any one of us -- when having to meet The President. The West Wing was around at an important time. It reminded us that America still has ideals and a beating heart at a time when the real administration was meddling with the Middle East and letting its most historic, beautiful town get lost in a sea of flood-water. It gave people hope, it made people dream. The characters in The West Wing were everything we want in politicians, in humans, in our friends--- they were good people trying to be great. The power of the show cannot be better demonstrated than in this now legendary scene where the President challenges a radio presenter on her views of religion and homosexuality. Bartlet spoke in the way we all wish we had the knowledge, eloquence and imagination to do. More than anything, I'm a comedy guy. And The West Wing filled that need in ways I never expected. Sorkin's rapid fire dialogue is more like dancing, than talking - and within the rapid paced talking there was always more wit and intelligence than you could find anywhere else on TV, or even film for that matter. Here's the President Of The United States getting obsessed at Thanksgiving with the Butterball Hotline, which gives advice on how to cook a turkey. This scene is hilarious -- especially when the woman asks for his name, and the President realizes he probably shouldn't share his identity. Magic. 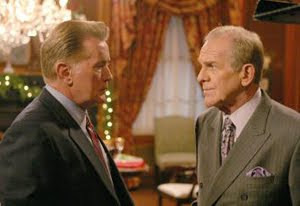 I'll finish with one of my favorite moments from a very early West Wing episode. The staff are out in a bar having some fun --- when a group of guys start to pick on the President's daughter, Zoey. An incredible scene -- full of all the things that made The West Wing the greatest thing ever to grace our small screens. Go rent it/buy it/steal it -- you will not regret it. But I'm just trying to buy some groceries?" You are right. Completely. I must have rewatched all seven seasons at least five times now. I strongly believe that it has influenced the way I write and, as a result, what I'm going to do with my life. How does a television show manage that? By being this good. I sometimes wonder what the last three seasons would have been like if Sorkin had stayed. They're still excellent, obviously, but, you know, I wonder. No way. I completely disagree. Hence I wrote a summary fo series 1 to say how rubbish i thought it was. And obviously, if it hasn't sold me in series 1, im not watching anymore! I LOVE the West Wing! I just made my mum watch the whole thing. I got the full series boxset not long ago and kind of watch it on loop. It never gets old. I don't like the later seasons as much as the earlier ones, but it's still fantastic tv. As I was reading this I was thinking about the bible scene. I also love the one where he's high on his back meds. Always makes me laugh. Simon - sorry to hear you don't love it. Seems like you had some pre-conceived notions that it didn't mean. Oh well, can't win them all. Everyone else - this is so exciting discovering other West Wing addicts! It truly is the most amazing show. Louise, please do buy it - it's wonderful. The characters, the dialogue, the drama of it, the wonderous humour... it's just incredible. As for politics, I'm not a political guy, but the show, just by mere bringing up of topics in a fun and interesting way, it really perked up my awareness around some issues. But it was more about story and the humor to me than anything serious. The West Wing is fantastic. The only negative is that in Season 3 there is a great monologue by Leo about whiskey which led to me developing an obsession with buying Johnny Walker Blue which I finally did recently. And everytime I look at that purchase on my credit card statement it brings a tear to me eye. But that's the persuasive power of The West Wing for you. I also blame it for getting me into Gilbert and Sullivan. I can't believe I've stumbled across a group of people who love West Wing as much as I do! I also just keep looping it all year long and then start again. Each episode is so well crafted, I continue to find new things to love about this show. I am always trying to convince others to WATCH THIS SHOW! I am obsessed, I know, but I just can't seem to get enough. Last week I told my husband that Obama needs to watch West Wing, he'd get some great ideas for how to get stuff done and keep his integrity intact! The West Wing was indeed a terrific show. It really elevated politics to a level where we, the viewers, could actually believe that capable, culpable, and intelligent people ran around the White House trying to make America a great nation once again. It was never trite - just inspiring. And as you already mentioned, the dialogue was amazing. However - I have to argue (since I like a little more dark humor) that one of the best tv shows of the last decade were seasons three, four, and five of Buffy the Vampire Slayer. Thank you everyone for the wonderful comments. Like Sandi says, this is incredible - to see people who love it as equally as I do. Thanks so much for the amazing tribute to the show. You really made my day and I'll be sending it around to everyone on the cast and crew list. It is great to find other people still talking about West Wing. I also LOVE West Wing I have all seven seasons and I love the honor, integrity and morals that the characters portray! I do not even care which political party that they are. I love the integrity of all of the roles. I’ve often wondered why I’m so addicted to it. But, I know it is my hunger for good, honest, real, moral people and to add social citizenship and leadership Wow then we have it all. Let's bring West Wing Back!!!!! Great to hear the West Wing is still out there, and the way it looks in full force :) I miss this show, it really was one of the best ever created! Thanks for the write up! Its like i wrote this post! the WW is the best ever.